Zazie Beetz was on hand as a nominee on Monday(September 17th) for the 70th Primetime Emmy awards on Monday(September 17th) at the Microsoft Theater in LA. 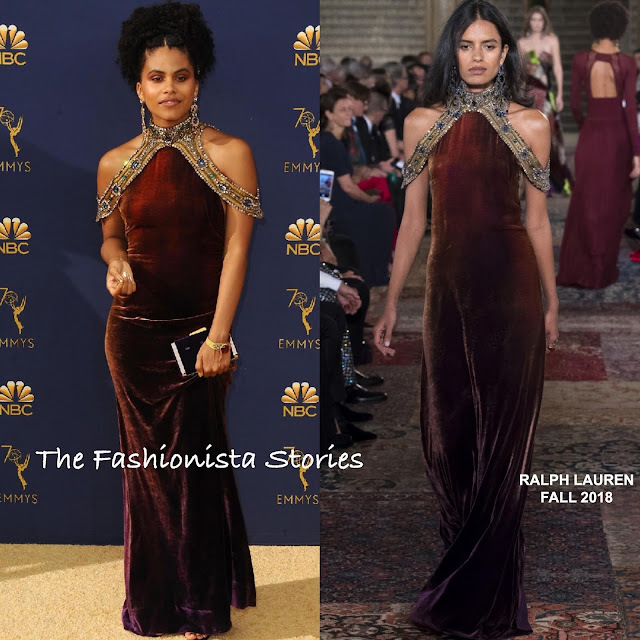 While I think it maybe too warm for this, I did like her RALPH LAUREN FALL 2018 burgundy velvet, embellished gown, featuring a high neckline and cold-shoulders. Although my main issue here is that the gown is too long on her, given the way that she is holding it. However, despite that, again she was beautiful. A JIMMY CHOO clutch and a natural curly up-do finished up her look.